It's been a while since I did any watercolouring so I sat down for a quiet morning in my craft room. 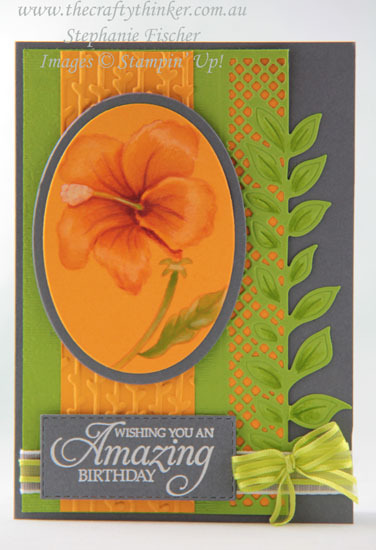 The flower was stamped with Petal Pink onto the Mango piece and then watercoloured with Mango Melody, Cajun Craze, Pumpkin Pie and Lemon Lime Twist with a few Whisper White highlights at the end. I also added a little shading to the die cut leaves with Lemon Lime Twist ink. The greeting is white heat embossed and cut with one of the Stitched Rectangle dies.